The 2018 Pan Mass Challenge is only a few days away. 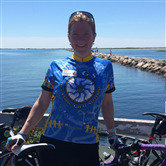 Once again, Wolfram and I will be riding together from Sturbridge to Provincetown. This year, we were able to train around beautiful Boston to make those hills around Sturbridge feel like a breeze. Riding with Wolfram makes me so very happy and reminds me how fortunate we are that he was able to receive outstanding treatment at the Dana-Farber Cancer Institute, and continues to do so well. Seeing friends being diagnosed with cancer or losing their courageous battle with this terrible disease reminded us again this year that we cannot take anything for granted, and that we still have a long way to go before cancer will no longer be a scare. My goal this year is to raise $4900 to bring us a step closer. Please donate to my PMC ride through one of the links on the left. Your donation is tax deductible and 100% will go to Dana-Farber Cancer Institute.